You might already know that since the first generation of Microsoft Surface Pro (2013) and Surface 3, Microsoft has implemented a new firmware called Unified Extensible Firmware Interface (UEFI) on those devices. As this new firmware interface allows your Surface boot faster and providing better security improvements. 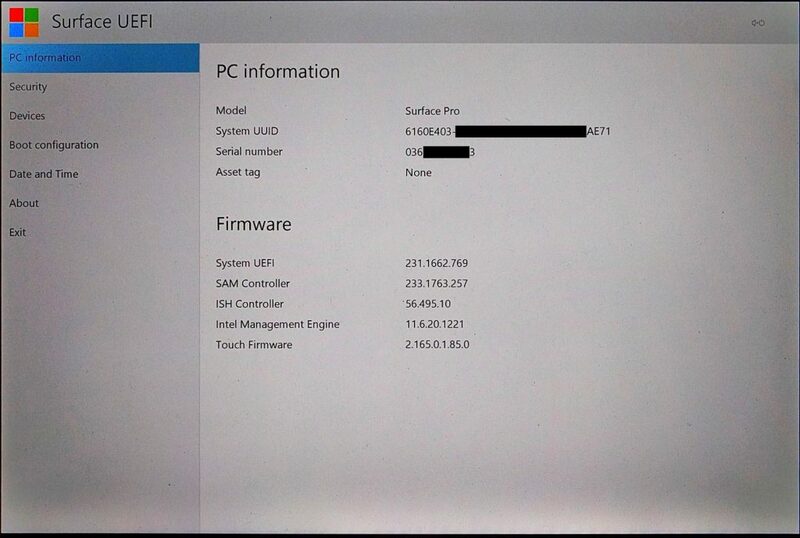 Starting with Surface Pro 4, Microsoft has created their own Surface UEFI for using with newer devices. This new Surface UEFI is currently used on newer devices including Surface Book and Surface Studio. In this article, you will find out how to get to the Surface Pro (2017) UEFI settings. You will see also about how to configure the UEFI settings to improve the device security, check your device information and more. How to access Surface Pro (2017) UEFI settings? How to Check Your Surface Pro (2017) Device Information via UEFI settings? How to Configure Device Boot Order on the new Surface Pro (2017)? How to Manage Device Components on Surface Pro (2017)? 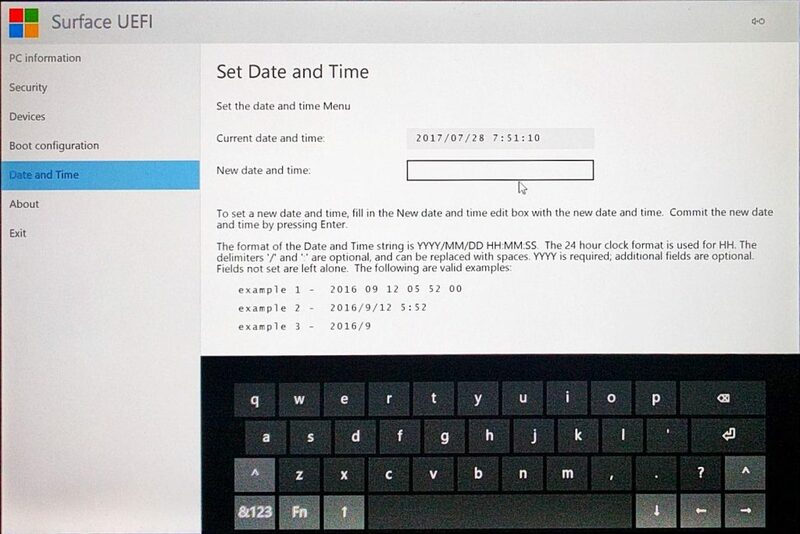 How to change your Surface Pro (2017) Date and Time via Surface UEFI? 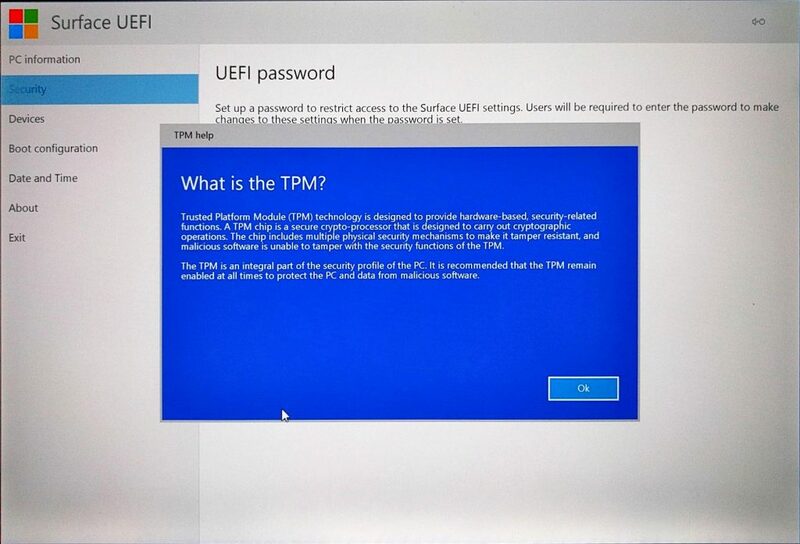 How to Protect UEFI settings with a password on Surface Pro (2017)? What is Secure Boot Control? 1 How to access Surface Pro (2017) UEFI settings? 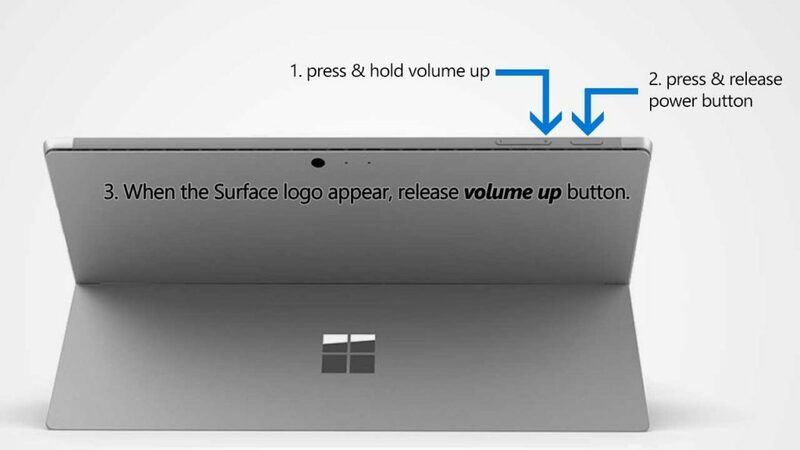 Press and hold the Volume Up button on your Surface, then press and release the Power button. When you see the Surface logo screen appear, release the Volume Up button. 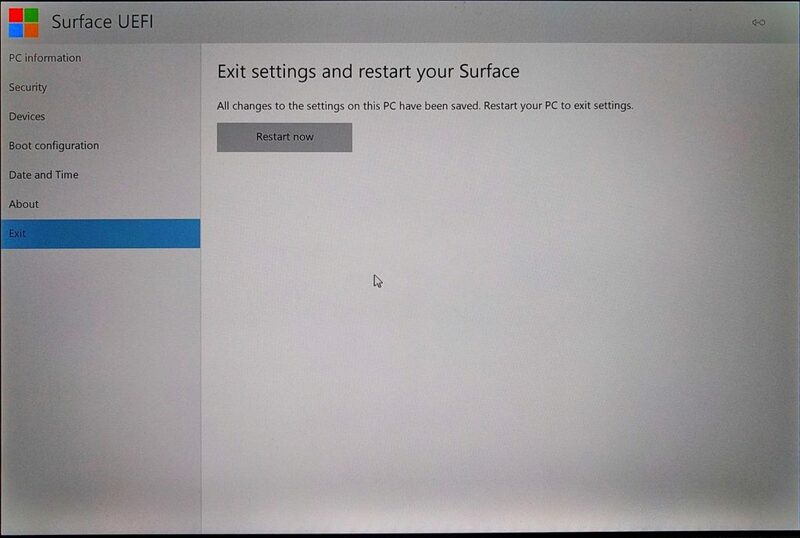 The Surface UEFI screen will appear in a few seconds. 2 How to Check Your Surface Pro (2017) Device Information via UEFI settings? The first displayed page when you enter UEFI settings is PC information page. On the page, you can find out more information about your device identities such as Model, System UUID (Universally Unique Identifier), Serial Number, and Asset Tag. Moreover, it also displays all important system other components version that you might need for troubleshooting. 3 How to Configure Device Boot Order on the new Surface Pro (2017)? 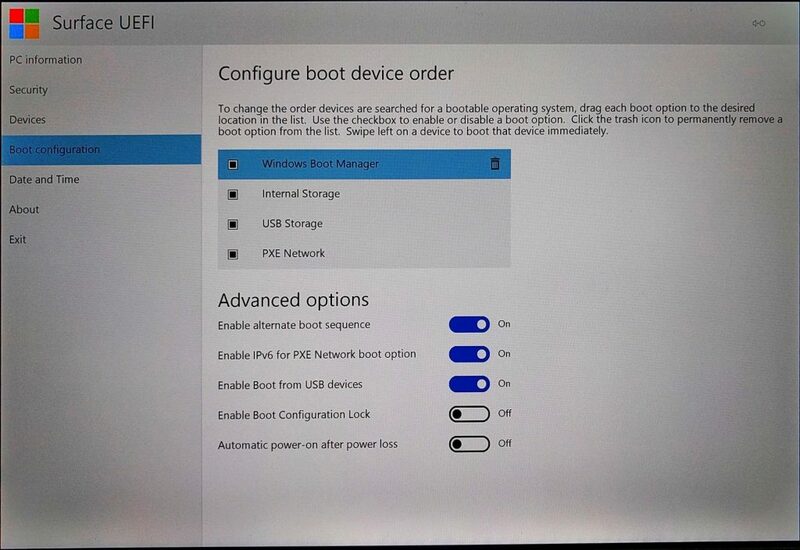 Enter Surface UEFI settings as the instructions above. Rearrange boot order by drag and drop any boot option available in the list. Remove available boot option permanently by using the trash button. Note if you accidentally delete Windows Boot Manager from your Master Boot Record, simply restart your Surface and Windows Boot Manager will reinstall automatically. 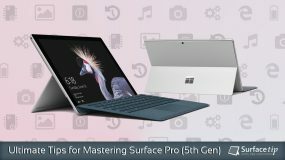 4 How to Manage Device Components on Surface Pro (2017)? 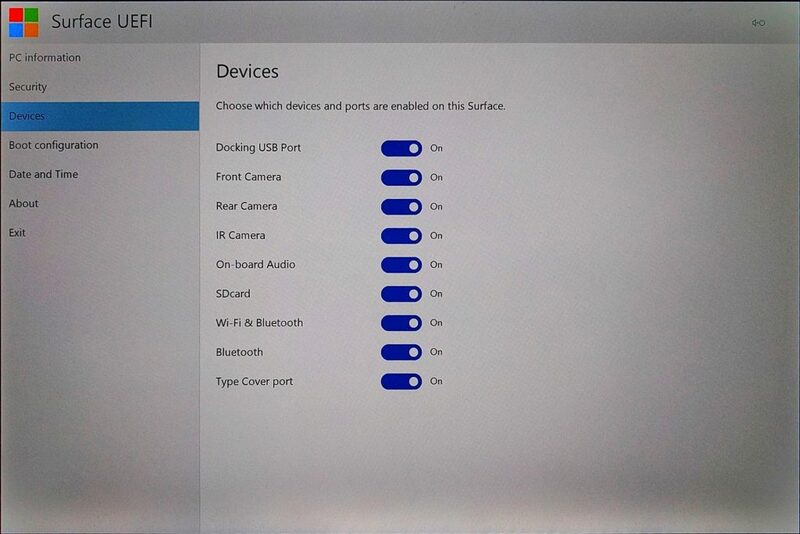 Access Surface UEFI settings as the instructions above. 5 How to change your Surface Pro (2017) Date and Time via Surface UEFI? To set a new date and time, select the edit box and type your new date and time. Press Enter to apply changes. 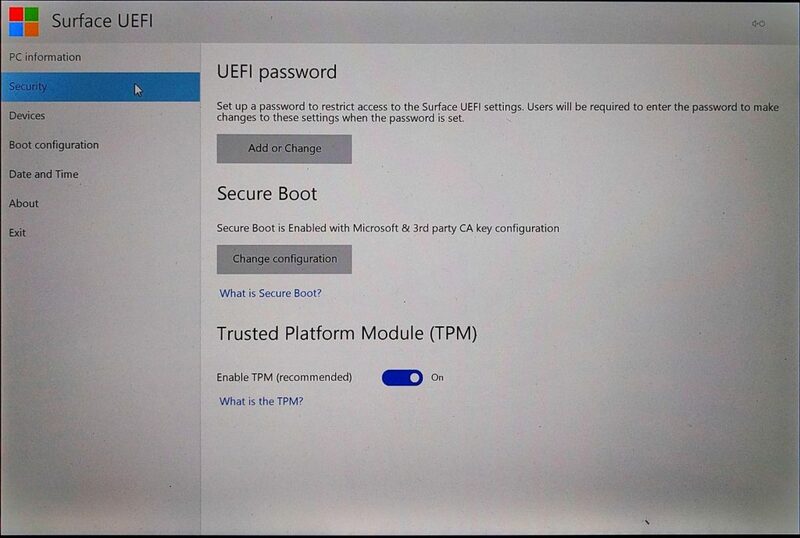 6 How to Protect UEFI settings with a password on Surface Pro (2017)? May contain a combination of letters, numbers, and special characters. In case that you have already set the password before and you want to remove it, simply leave the password box as blank. 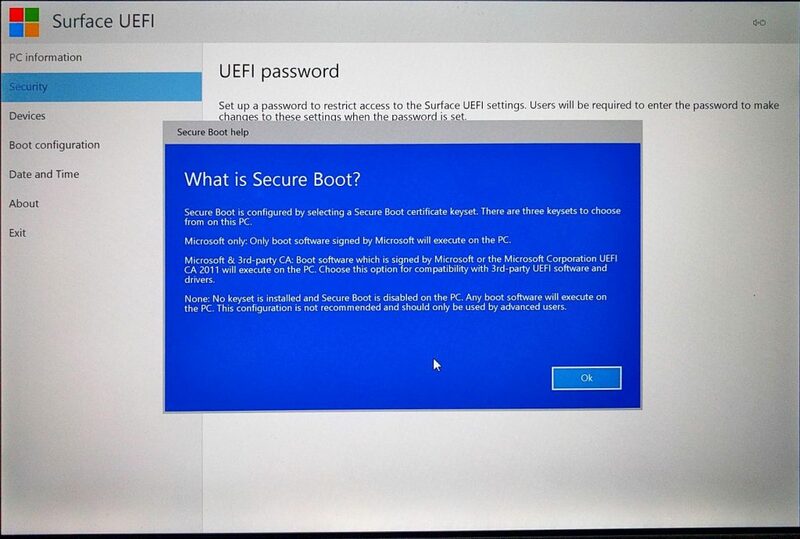 Note If you enter the administrator password incorrectly three times, you’ll be locked out of the UEFI. 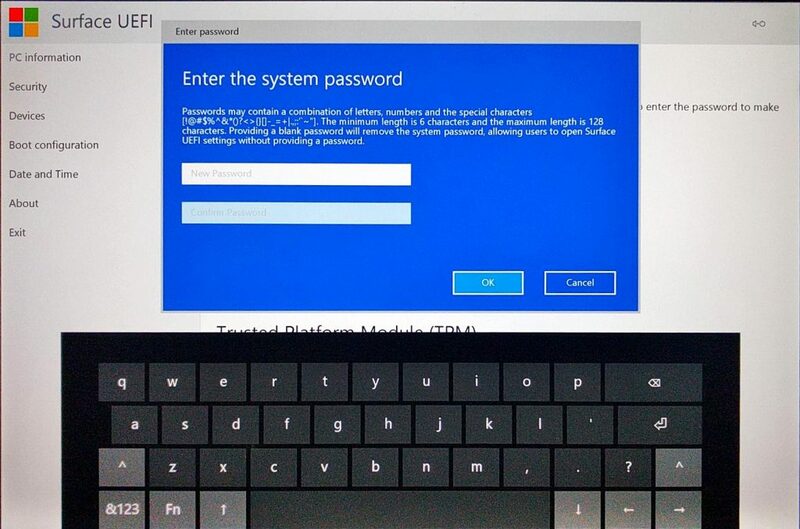 Restart your Surface to enter the password again. Important If you set a password for the UEFI, record it in a safe place. If you forget the password, you won’t be able to access the UEFI settings. 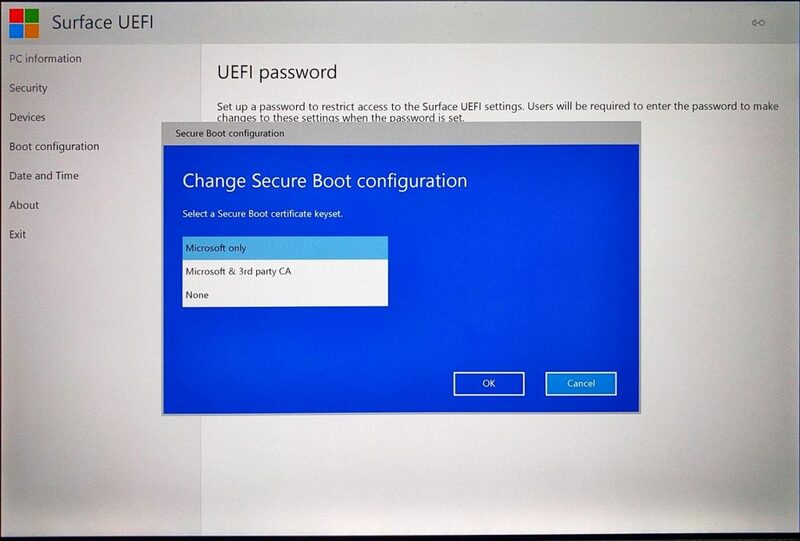 You can only reset the administrator password from within the UEFI. 7 What is Secure Boot Control? The Secure Boot is a technology which blocks the loading of uncertified bootloaders and drives. It helps to prevent your Surface being loaded with unauthorized operating systems and malicious software applications. If you desire to install other operating systems like Ubuntu, or other Linux distributions, you may need to disable this feature in the UEFI settings above. 8 What is Trusted Platform Module (TPM)? The Trusted Platform Module (TPM) is a technology that provides a major advancement over BIOS in hardware-based security features. It is a specialized chip that stores RSA encryption keys specific to each Surface device for hardware authentication. The TPM technology is a requirement of BitLocker disk encryption. The TPM helps you to encrypt/decrypt entire disk without required your complex long passphrases. It means that the encryption key and decryption key are stored within the TPM chip. So your encrypted disks can’t be accessed on other devices. We appreciate hearing your thoughts, questions, and ideas about “How to Configure Surface Pro UEFI/BIOS Settings”. Please post respectful comments and on topic. We will be replying back to you as soon as possible. 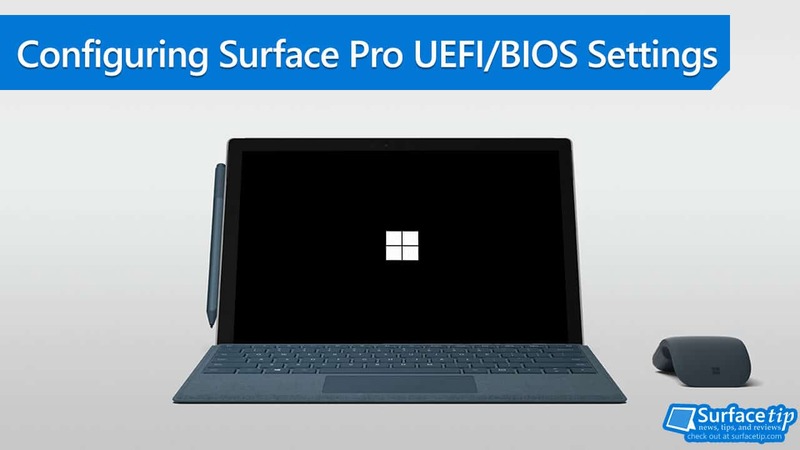 Share your idea about "How to Configure Surface Pro UEFI/BIOS Settings".